Macho Tacos, Macho Tacos, Macho Tacos- say it three times fast. You'll be hearing a lot about it for awhile I'm guessing from my first few visits, as we finally have a little "hole in the wall Mexican place" right here in Taipei. I had been hearing about it from a few readers before I had a chance to visit and I didn't want to have too high expectations especially during their soft opening month in December, but I'm happy to say that they are definitely on the right track and should soon become a favorite craving for many, including myself. What sets Macho Tacos apart from the other Mexican places in town? (1) The "Baja style Mexican" menu and prices. Set up more like a taco joint you'd find near a college campus in LA rather than a sit down eatery, the prices are good for what we're used to paying for "foreign" foods. 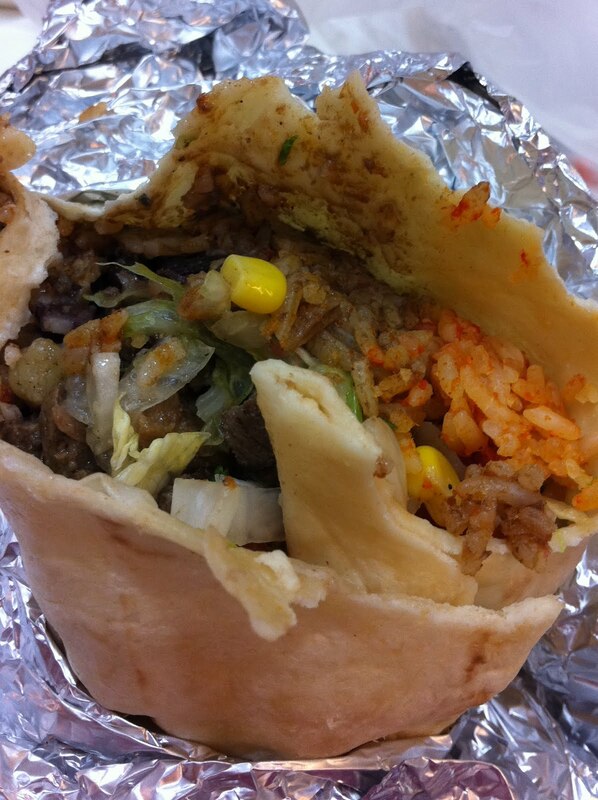 There are soft and hard tacos, burritos, burrito bowls, quesadillas and nachos, all available for under NT$200. The brightly lit signage is in English and Chinese with lots of pictures for newbies and the person taking my order seemed to understand everything even when I was ordering in English. There's also horchata (which my friend had for the first time) and beers. One con is that Macho Tacos only has about 12-15 sit down spaces that fill up quickly, but thankfully the food keeps well to-go, staying warm and crispy in the right ways. (2) Fish Tacos on corn tortillas! Macho Tacos replicates the experience of the fish taco (3 for NT$150) without any weird localization- down to the tiny piece of lime to squeeze, crispy fried fish topped with fresh cabbage and creamy, white sauce on a corn tortilla. Though the first time I felt the corn tortilla to be on the dry side, piling on the salsa helps. I know they are still tweaking all their menu items and their corn tortillas are handmade, so we'll see how it changes in the next few months. (3) Mexican rice and beans! It's not until you've sampled all the strange flavors passed off as rice and beans at Mexican restaurants in Taipei that you can appreciate how normal the rice and beans are at Macho. There is even a choice of black or pinto beans, as well as Mexican rice or cilantro lime rice- for your burrito or as a side. It fills up the burrito and makes it complete, yet there is still was a good portion of steak in my burrito. If you're hungry, I recommend getting the bigger size or macho steak burrito (NT$185) and maybe a taco or three. For me, the location is perfect- on the Eastside, or Dong Qu, which is in my neck of the woods, not in Gongguan or Tianmu or Danshui. Can you imagine one day that there's little Mexican spots all over Taipei? It would be crazy! Macho Tacos can be a little tricky to find and is easier to figure out from Yanji Street, though it's not too far from Lane 248's Toasteria and Alleycats. Of course I had to try a little bit of everything to see what it tasted like. My favorites were the steak burrito and fish tacos- the meat of the carnitas/pork taco (NT$50 or 3 for NT$140) was a bit dry for me though I loved that each taco was doused in fresh pico de gallo, or chopped tomatoes, onions and cilantro. and the chicken in the chicken hard shell taco was very bland, but the taco shell was fresh and crispy. I could see the diced chicken working in a quesadilla or burrito, but in a taco, it didn't seem to have any flavor. Both were made better by the salsa available in the mini salsa area, but I'd probably stick to my favorites on repeat visits. 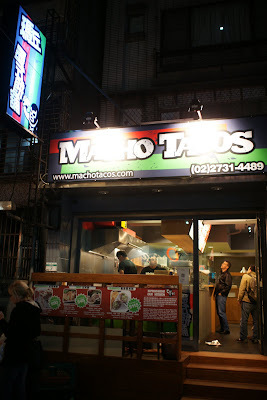 I might try the tofu tacos in the future and it would be cool to see if Macho could add shrimp tacos or burritos to their menu in the future. I also wasn't crazy about the guacamole, as it was the squirt kind rather than the fresh, chunky kind and a side of NT$40 was a tiny plastic tub. I also heard that their nachos are made with nacho cheese which kind of excites me though I know that's more Taco Bell than Baja Fresh. If you want it on the spicy side, you can look for the hot sauce bottles if the salsas don't do it for you. There's no question that I have been waiting for a place like this for awhile, and it will be interesting to see if locals can also find a way to love Cali-Mex after years of eating Tai-Mex. Happy new year everyone! 2010 has been a great year for eats in Taipei- can't wait to see what 2011 brings us! Kid friendliness: high chairs and kids dinnerware available. 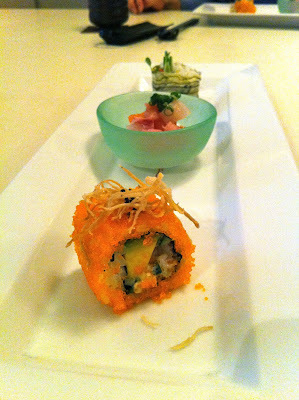 From the beginning to the end of the meal, I love this season's set menu at San Want Hotel. Every bite satisfied and had layers of flavors that complemented the dishes before and afterwards. The rich broth and silky texture had everyone at the table raving- this has to be one of the best steamed eggs I've ever had. I love sweet shrimp and uni. I always love Sumie's fresh sashimi and presentation- when it's so good, it melts in your mouth. If you don't eat raw fish, you can ask them ahead of time to switch it to something else. I always forget that they have raisins in their salad- yuck. I move them to the side and I'm okay, though I'll have to remember next time to ask them not to put them on in the first place. A light Japanese citrus dressing on the salad with chopped fruits and vegetables atop fresh greens. 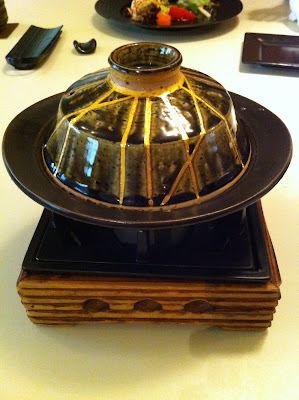 This dish is served with the lid covered and the server asks that you remove the lid when you see steam coming out. 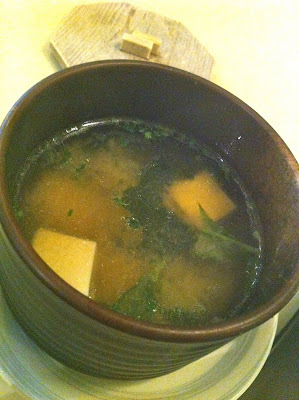 The broth/sauce is slightly sweet and I think there was some fish hiding underneath. I was too busy eating and enjoying to take notes! The portion of this is just right for such a full set menu, but if you are coming for dinner or your first time, I recommend that you switch out the steak for lamb chops. The lamb chops at Sumie are my favorite anywhere with a slightly sweet marinade and tender bite. Some people are too full by this point to eat anymore (not me! haha! ), but I love the bites of rolls that come at the end. The mini-chirashi sushi is so cute and leaves me wanting more. Sometimes their broth at the end is too huge or gingery for me, but this one is just right. Ordering a set course at Sumie can seem expensive, but it's well worth the price, especially if you're celebrating a special occasion. With lunch sets running from NT$500-900 and dinner sets at NT$1500 and up, the presentation, quality and taste surpasses lots of other Japanese restaurants where the prices will add up anyways per person. You can always have one person order a set menu and another order off the menu if you're afraid you won't finish. The set menu also changes seasonally, so I love being surprised by what's coming. Bacon + cheese + a soft bao = awesome! When I saw the ladies next to me pick up 20 of the same buns at Chao Zhou Bao Zi on Lane 216, I had to ask- what are you getting? She said what sounded like "pei-gan chee-zu bao" or bacon cheese bao (NT$20) and totally sold me on it. I had to try one as well and I'm so glad I did. If you pick it up hot, the cheese is oozing inside with chopped up pieces of bacon which goes perfectly with the slightly peppery, soft bun - kind of like a Taiwanese hot pocket. An indulgence that's much better than the processed breakfast sandwich you'd get at McD's. You can also pick it up warm/cool, to freeze or store for later reheating/steaming and consumption. I've gone back several times to get it and sometimes they are sold out at different times of the day. I've also recommended it to friends who have also become addicted. While I like their meat bamboo baos, I prefer the meat to bun ratio from the Lao Guh Tsui Jian Bao place down the street. But the bacon cheese bun I've never seen anywhere else! Though they've revamped their storefront sign, the signs for the buns and mantous are still all in Chinese and it's hard to tell what's available unless you ask in Chinese. They have a pretty wide variety and there are savory as well as sweet buns- like sesame or red bean or brown sugar mantou. Since there are several places on 216, look for a sign on the corner that looks like this bag.. I'd always pass by Very Thai on the way to Momo Paradise or Chili's in the Neo 19 building, but never felt the urge to try it until one day I wanted pad thai for lunch. I could have went to the nearby Thai Town, but I thought I'd give Very Thai. The English and Chinese menu has an assortment of appetizers, rice/noodle dishes, curries and seafood dishes, desserts and drinks. Despite the decor and setting of Very Thai being very pop/modern/American- with magazine cut outs of American movie stars along one wall and the MTV's the Hills playing above the bar on another, the food is not Americanized Thai food. 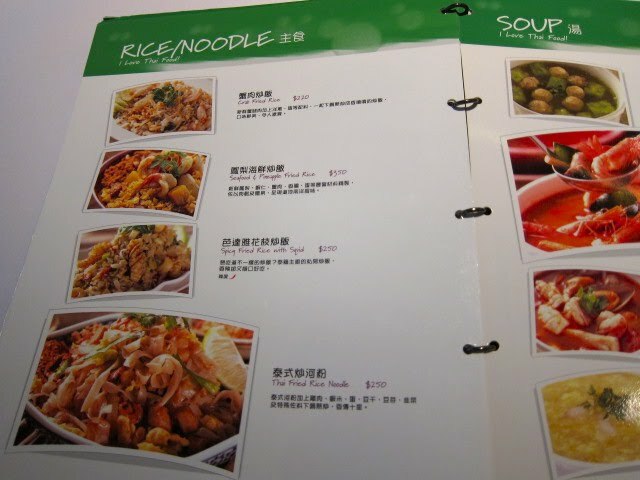 After living in Taipei, some people miss Americanized Chinese food- orange chicken, beef and broccoli or mu shu pork. Sometimes I miss Americanized Thai food- the pad thai in LA comes on the sweet side, tinged pink or orange and that's how I like it. I don't mind the more natural tasting pad thai here, but it just seems to be missing something. In this case, the Thai fried rice noodles was missing noodles! There seemed to be more bean sprouts than noodles and the taste was all savory with no hints of sweetness. For the price NT$250, the portion was on the small size. At that point, I missed the heaping portions of delivery Thai food in LA for the same prices. Luckily, the chicken satay was a lot better- fat juicy tender pieces that were nicely grilled with the cucumber and peanut sauce. Is it fair to judge a place on two dishes? Usually I get to eat at places with relatives or friends, so we get to order more and I get to taste a little bit of everything. But what if I'm dining alone- there's no way I'm going to be able to order a tableful of food and there was no lunch special option for lone diners like they do in the states. 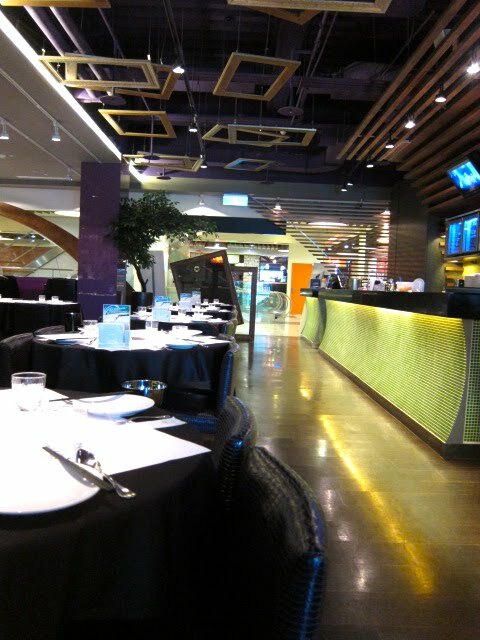 Not busy at all on a weekday lunch, Very Thai could be a fun spot for dinner and drinks and ordering other dishes to share in a larger group. There were other things on the menu that looked tempting, like the Deep Fried Soft Shell Crab with Thai Sauce, but it was a little disappointing that pad thai wasn't good. 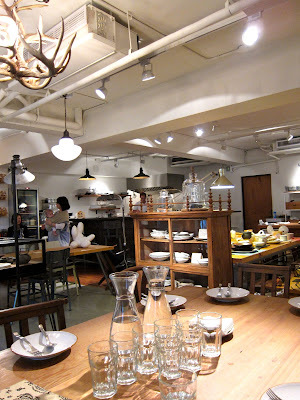 Taipei is full of these strange and interesting little restaurants- a little bit Japanese, a little bit French, a little bit Italian, a little bit Chinese- and a little bit of a furniture/clothing shop? Whiple House has the unique quality of being a restaurant hidden on the second floor of what appears to be a woodsy clothing store- look for this storefront if you ever give it a try. Once upstairs, the kitchen is tucked in the corner and family style seating takes up most of the second floor, with some interesting displays of vintage looking goods off to one side. The menu is unfortunately only in Chinese without photos, so I relied on my friends to order- especially the ones who had been before and chose the place. My favorite dish and the main reason I'd come back is for the uni spaghetti with crab (NT$480). Creamy with a balance between the sweet and salty, a bite of the uni spaghetti is complimented by the chunks of sweet crab meat. I kind of wanted a whole plate to myself. Less interesting was the mentaiko spaghetti(NT$320) which seemed to lose its fishy bubbles of roe after it got to me. I could taste more of the seaweed and olive oil than anything else and even had to double check with my friend that it had mentaiko in it. If you get a salad, get the one with the mountain yam and poached egg and tofu (NT$280) over the one with beef, bacon and beans (NT$360). The bacon was hard rather than crispy and the elements of the first salad worked better together. or with this hot cheese and egg (NT$280). The server put a raw egg into the hot cheese and stirred, and then recommended that we spread it atop the bread while hot. The result was kind of like a soft scrambled egg with cheese spread and something I think I might experiment with at home. The mushroom soup (NT$150) was good and they had split a bowl into different cups for us. The risotto was very al dente and reminded me of the risotto from Bianco, but the Bianco's risotto had more layers of flavors. If I could make a recommendation, that would be to skip the steak/beef or even the meats in general. They run on the pricey side and are not as satisfying. We had the waitress help us order, and since we had a large group she decided we could sample a bit of everything. The grilled pork (NT$480) had a side of saukeraut and veggies. The steak (NT$880) was my least favorite- a bit tough and chewy and definitely not worth the pricetag for the portion (though I can't remember if there were two plates of this size at the table). So give it a try if you're looking for something a little bit different, or like to do your window shopping while you eat. last day to vote for Readers' Choice!